As fears rise over the use in election campaigns of data mined from social media, Cambridge Analytica chief Alexander Nix seeks to distance the company from politics. Cambridge Analytica, the world’s most (in)famous behavioural data strategy company, might have gained its notoriety after it helped usher Donald Trump into the White House but chief executive Alexander Nix says politics provides a "very small amount" of the company’s revenue. "Our job is not to dictate the policies of our candidates or even influence them but simply to articulate them in the most clear and meaningful way to the relevant audience," he says. Trump’s surprise win has led to a media fascination with Cambridge Analytica and the methodologies deployed to help him become the US president. So there’s an expectation that Nix will have a feline companion on his lap and bear a resemblance to a James Bond villain. It’s not quite the case – Nix quips that he’s more of a "dog person". Nix does, however, appear to savour some of the hype surrounding the company. "The press is a double-edged sword. While some of the things written about us are just not true, it is true we are getting enquiries from businesses we otherwise wouldn’t have received had we not had that [fame]," he says. The company is part of an investigation by UK data privacy watchdog the Information Commissioner’s Office, which is assessing if data protection rights were breached during the vote on leaving the European Union. Nix says Cambridge Analytica is not involved in the general election. And despite his previous claims in Campaign, Nix adds: "We never worked with the Leave campaign." "I’m not privy to the ICO’s agenda," he says. "My understanding is it is conducting a piece of research into all manner of people who have an expert understanding of data so it can educate itself on the art of the possible and then start to use the information to understand whether changes are required." An ICO spokeswoman says: "Our contact with Cambridge Analytica remains ongoing and this is part of the wider investigation into the use of data analytics for political purposes announced by the information commissioner on 17 May." So what does Cambridge Analytica actually do? Its calling card, Nix explains, is the synthesis of behavioural and data science – the ability to identify and target, understand motivations and trigger action, whether that is to vote or to purchase. Nix adds: "[It’s] nothing Machiavellian. It [the Trump campaign] was a brutal testing of our methodologies at breakneck speed. We are now battle-hardened and ready to use these methodologies for brands." He says ad agencies continue to use data to post-rationalise creative executions and lack the sophisticated tools possessed by companies such as Cambridge Analytica. Nix also vehemently rejects that Cambridge Analytica uses psychological profiling: "We call it behavioural communications instead." The work on the Trump campaign is a clear example of how data-driven marketing techniques can change behaviour in target populations. Nix also cites the example of Psyop – a US psychological operation to counter radicalisation. "How do you persuade impressionable young boys not to join al-Qaida?" Nix says. "It isn’t going to be through a TV ad done by a creative agency in London. It’s about using vast quantities of research and data to understand the motivations, the power structures, what groups these youth belong to and take all this data and deconstruct it to help save lives." 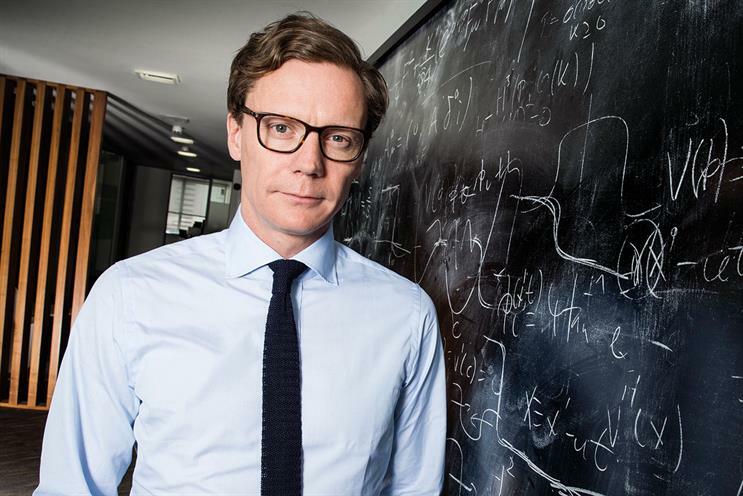 Cambridge Analytica gets involved in six or seven election campaigns a year around the world "but what we are really doing is using data to work on some profound and complex issues". In South Sudan, contracted by Unicef, Cambridge Analytica created a communications strategy to reduce child marriage. It developed an implementation plan, delivery timeline and a system to monitor impact. During the 1994 elections in South Africa, when a Nelson Mandela win was a given, the role of Cambridge Analytica, then known as SCL, was to reframe elections away from tribal conflicts. For all the brouhaha over how data is mined and used, Nix maintains Cambridge Analytica is using "pretty bland data in a pretty enterprising way". He adds: "My long-term ambition is to be an agent of change." Nix says that in 2015, Cambridge Analytica held discussions with Leave.EU about working for the campaign but decided against it. "We were looking at different opportunities to get involved in working with Brexit but we made the decision to not work with any party – for or against – or even for any related campaigns," he says. According to a spokesman, Cambridge Analytica had no involvement in last year’s EU referendum. He adds that the Nix article in Campaign (11 February 2016) in which he wrote "CA has teamed with Leave.EU… to help them better understand and communicate with the UK voters" was penned by an adviser who "assumed Cambridge Analytica would eventually work with the campaign". The spokesman says: "CA has never been retained by Leave.EU or provided any services – paid or unpaid – to Leave.EU or any other of the campaigns." Cambridge Analytica also denies allegations published by The Observer. A spokesman says the company is "pursuing legal action in this matter".